HR organizations are moving toward creating exclusive employee experience by promoting a collaborative workspace culture, enabling the power of analytics, and empowering employees to control their own career path. 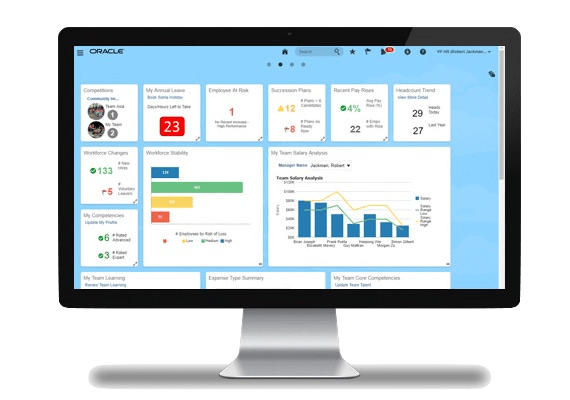 Oracle HCM Cloud helps you move beyond the inefficiency and costly upkeep of disparate systems while providing the workforce insight and HR operations flexibility to meet evolving business needs. HCM Cloud offers a way for rapidly growing organizations to run their operations using a low cost, minimal risk and quick to deploy modern business platform. User experience delivers the latest in self-service, social, mobile, and analytics and addresses the full breadth of business operations. Like their colleagues in the C-suite, chief human resources officers are under increasing pressure to add value to the enterprise. In a recent Harvard Business Review survey of more than 300 business executives from a wide range of industries, 76 percent said they either have a strategic business partner in HR or would like HR to become better aligned with their company’s business strategy. Yet many of the CHROs responding to that same survey said they actually spend far less time than they’d like on the strategic activities they and their colleagues claim to value most, such as anticipating the talent capabilities required to build a high-performance culture, or understanding the factors that affect the growth of the business and how those factors should impact workforce planning and talent management. Not surprisingly, CHROs are looking for tools and technology that can help them spend less time on administration and more time on strategy—tools designed for an increasingly fast, digital, knowledge-based economy. Manage trends and create competitive advantages with HCM Analytics. 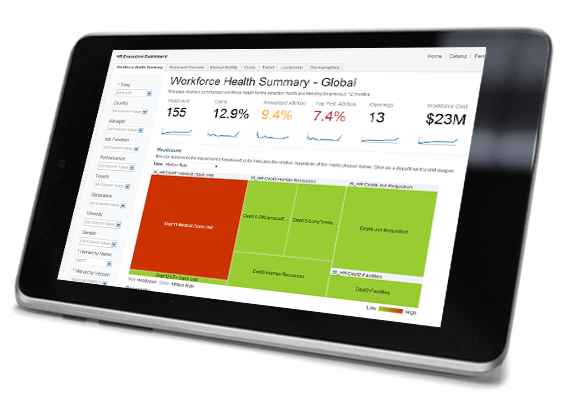 Powerful reporting and deeper workforce insights based on market-proven HR best practices, prebuilt dashboards, reports and metrics. Cloud-based HCM systems have matured to match — and even exceed — the capabilities of their on-premises ancestors. With the trend of migrations and project optimizations, cloud is fast becoming the standard for business. The pace of change for business needs is happening so fast that on-premises systems are struggling to keep up. This includes running data centers, maintaining software and managing integrations. 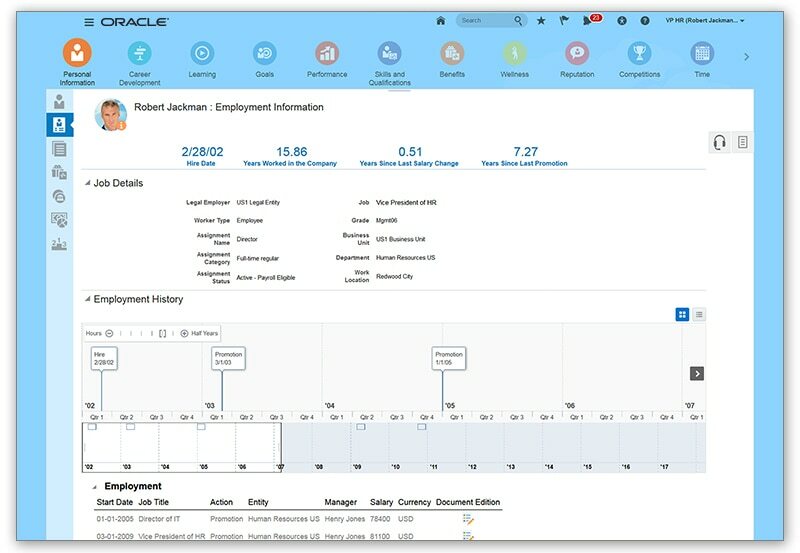 Oracle acknowledges cloud-based HCM is the future and has developed several implementation paths. HR systems are the heartbeat of an organization. They hold the master record where everything related to managing employees and careers resides. Systems that could be rigid and siloed in the past, must now be flexible and integrated. New dashboards for HR teams, new user interfaces for employees, and connected data are powering rapid adoption of cloud. Companies that migrate HR to the cloud reap the benefits for their businesses, for HR and for their employees. But transitioning from siloed legacy HR systems to an integrated cloud-based system does temporarily impose on the resources of both the HR and IT functions. Did you know, only 38% of employees say the learning and training programs they’ve received have been linked to their career development plans? Further, 80% of executives worry a lack of key skills within their workforce threatens company growth prospects. HR leaders are being called upon to elevate their responsibilities beyond the traditional role of recruiting talent and managing employee records and policies. Cloud-based HCM systems help expand the effectiveness of teams. Onboarding is streamlined. Employees have intuitive user experiences that improve development and satisfaction. Analytics and AI is incorporated to monitor the business and predict the needs of tomorrow. Moving information systems to the cloud can enable a smarter, more strategic HR team—and yield big benefits for business. An HR solution upgrade is a large investment, and organizations will need to quantify projected and actual ROI. By examining cost savings, productivity and workforce management improvements, organizations will be able to identify the ROI of their HR solution upgrade. A modern cloud-based solution can help increase overall productivity by allowing an organization to focus resources on issues with the greatest business impact — like workforce planning and employee engagement. With modern HCM cloud solutions, talent management decisions that used to take hours can now be done in seconds. Financial: cost of the current system versus the total cost of ownership of a new solution. Staff Gains: current full-time equivalents versus personnel savings by switching to a new solution. Information Handling: reduced administration times, reduction in manual processes, fewer workarounds and faster processing of outputs. Measuring the value of an upgraded HR solution can be found in a number of qualitative insights and quantitative metrics. As businesses upgrade aging core HR systems and consolidate multiple processes into an integrated solution, HR managers gain the ability to complete increasingly complex tasks. Other factors that contribute to evaluating the ROI of a new HR solution include direct purchasing costs, indirect costs and non-financial factors such as the solution’s contribution to strategic business objectives. In this evaluation guide, we’ll take you through your journey to the digital future of HR, with practical tips, advice, and even an easy-to-follow checklist that can help you ensure that the choices you make are the right ones for your department, your business, and most importantly, your people. A step-by-step guide for HR leaders and teams.